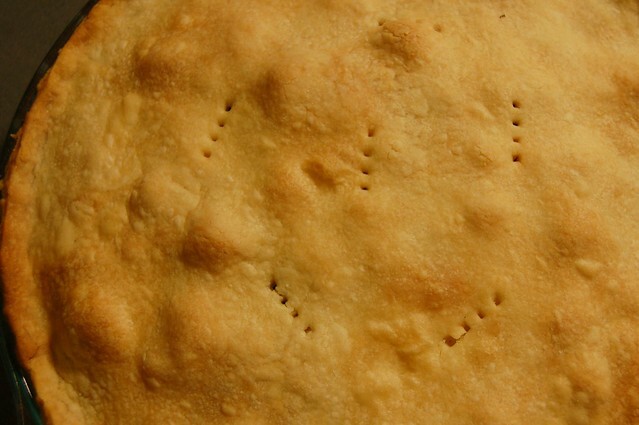 In my continuing obsession with Recipes From The Root Cellar , I recently discovered this delightful, savory pie. It's exactly the sort of simple, hearty food that I imagine my ancestors in Kiev must have eaten hundreds of years ago. If so, they were very lucky people. The pie is so good that, in spite of my resistance to recipes that require numerous steps or a lot of prep time (which generally rules out anything that involves pie crust), I have made it TWICE in the past month. The combination of the buttery pâte brisée crust, the concentrated sweetness of the roasted beets, the light, flavorful dill, the mellowly sweet sauteed cabbage, onion, and carrot, and the melty, creamy goat cheese leads to a rare kind of gustatory bliss. The kind that makes you close your eyes for a moment while you chew. 1. 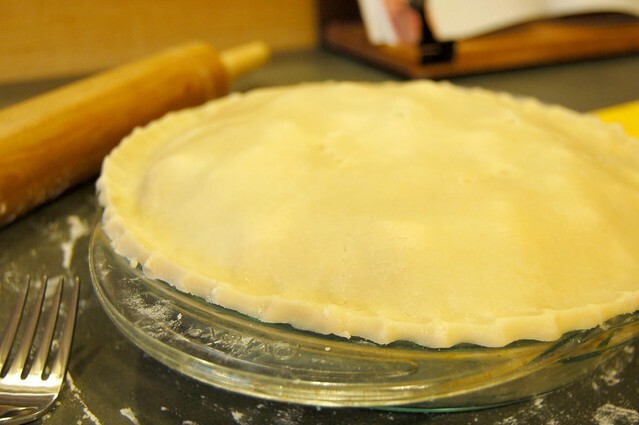 Make the pie crust dough (see below for recipe) a day in advance or earlier in the day so that all you'll need to do is roll it out when it's time to put the pie together. Roast the beets, slip the skins off and slice them in advance, too. 2. Once you've got the beets and pie crust ready, heat the olive oil in a large saucepan over medium heat. Add the cabbage and onion and cook until the onion is golden and the cabbage is completely wilted, about 25 minutes. 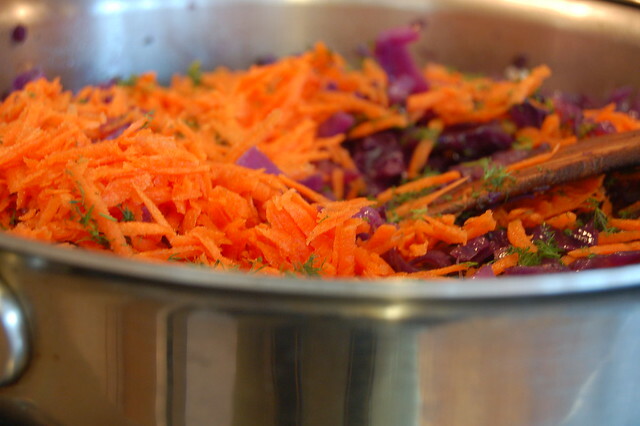 Stir in the shredded carrot and the dill and stir to combine. Season the mixture to taste with salt and pepper. 3. Preheat the oven to 400 F. Roll out the bottom pie crust and place it in a 10-inch pie pan. Then roll out the top crust so that you'll have it handy when you're ready, but leave it to the side (you can put it on a sheet of waxed paper to prevent it from sticking to the counter - that will also make it easy to flip it on top of the pie when the time comes) while you assemble the rest of the ingredients. 4. Arrange the beet slices in concentric circles over the crust in the bottom of the pie dish. Crumble half of the goat cheese over the beets. Spoon in the cabbage/onion/carrot mixture and top it with the remaining goat cheese. 6. Bake for 15 minutes, then decrease the oven temperature to 350 F and bake for 30-35 more minutes, until the top is nicely browned. Let stand for at least 10 minutes and serve warm or at room temperature with a fresh green salad. 3. Divide dough into two equal balls. Flatten each ball into a disc and wrap in plastic. Transfer to the refrigerator and chill at least 1 hour. 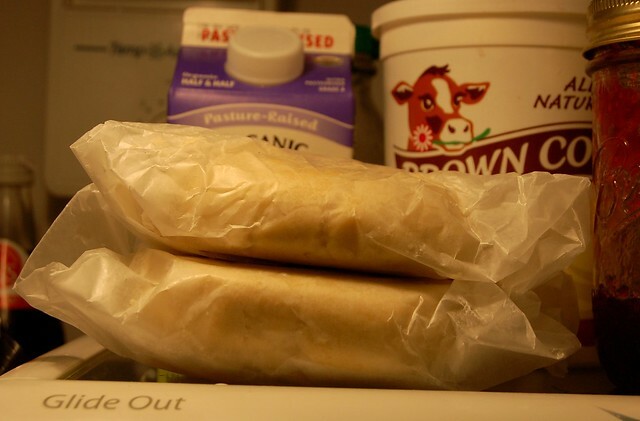 Dough may be stored, frozen, up to 1 month. But remember to remove the dough 30-45 minutes before you'll need to roll it out or you may find it too stiff to work with.